During Women's History Month we like to celebrate women represented in the museum's collections. The Gearhart sisters lived and worked in Pasadena, California, during the early 20th century, where they produced watercolors and prints that evoke their world. They also were influential educators in Southern California. None of them married, and they lived together all their lives. Each sister had her own artistic specialty and maintained a teaching career as well. Frances and May are best known as printmakers. Together with their younger sister Edna—a painter, poet, and author—they created a series of prints and poems for a children’s book, Let's Play, which incorporated their ideas about art and education. 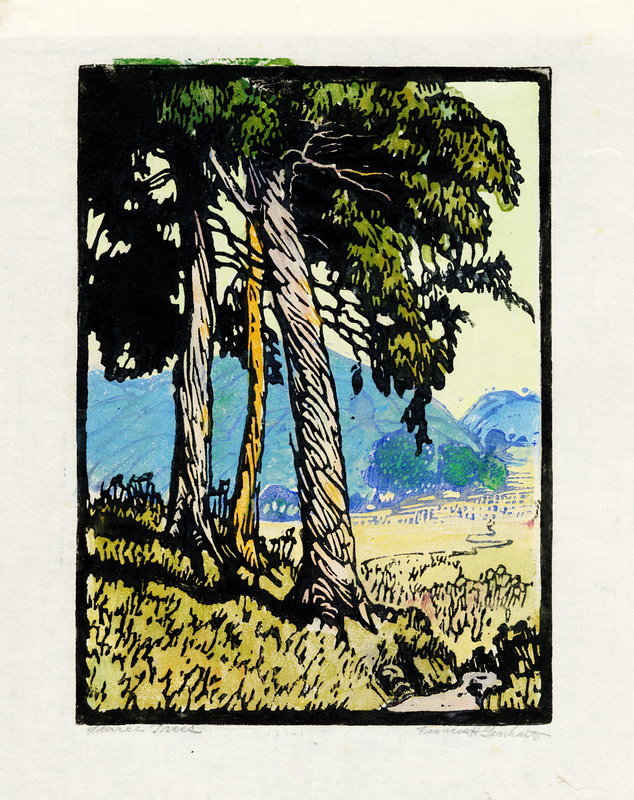 Frances Gearhart (1869–1958), who taught English history at Los Angeles High School, is renowned for her block prints, a medium that became popular during the 1920s. Block prints are cut in relief on wood or linoleum and can be printed by hand or on a press. Largely self-taught, she used strong outlines in black and white and a lively palette of fresh colors to make prints of the Western landscape. Her prints have a direct, visual impact, and they received much critical acclaim. At age 40 in 1909 she began exhibiting her watercolors with other teachers at the high school, and by 1911 Antony Anderson, the art critic for the Los Angeles Times, praised her talent and ability, singling her out for her "brilliant promise." 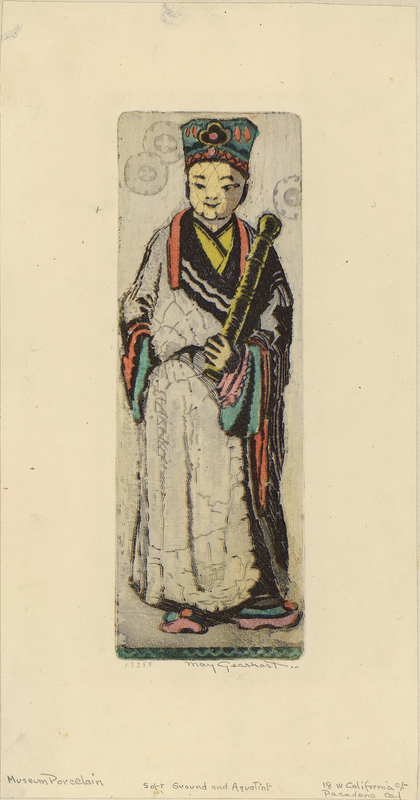 She began to show her block prints around 1919, and soon exhibited her work nationwide. May Gearhart (1872–1951) exhibited watercolors with her sisters beginning in 1911, and she and Edna studied with Arthur Wesley Dow, an influential artist and teacher. It's thought that their studies may have influenced Frances to try block printing. May took up intaglio printmaking during the nineteen-teens, and she varied the use of color in printing her small editions. In her etchings she experimented with soft-ground techniques that softened the etched lines and background to resemble pencil or chalk drawing. She studied and traveled widely, taking many summer courses on art and art education, and she worked as Supervisor of Drawing for the Los Angeles city schools for 40 years. Living in Pasadena, the sisters actively participated in the vibrant Arts and Crafts scene in the city. The Arts and Crafts movement rejected Victorian embellishments and industrial production. Its followers emphasized good design and individual craftsmanship in furniture, ceramics, art, and architecture. In the United States, the term "Mission style" sometimes was used to describe the Arts and Crafts aesthetic, and Pasadena brothers Charles and Henry Greene were important Arts and Crafts architects whose work had wide influence. 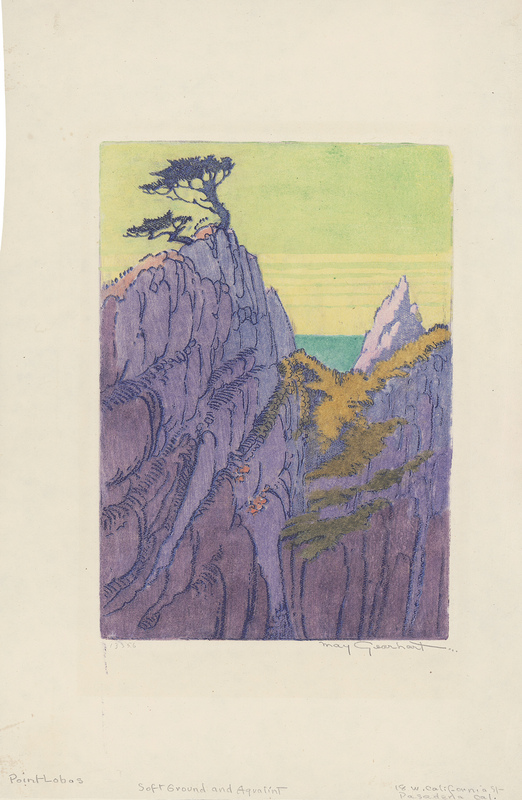 Japanese prints were an important aesthetic model for the Arts and Crafts movement, and California artists had several opportunities to view these works, including at the Panama-Pacific International Exposition held in San Francisco in 1915. During the early 20th century, inspired by Arts and Crafts principles, women became more involved in art shows and the marketplace, and the Gearharts were part of this lively exchange of images and ideas. Frances and May joined the Printmakers Society of California, later known as the California Print Makers, whose members met in the Gearhart home studio during the 1920s. The group organized traveling exhibitions, and works by Frances and May were shown at the Smithsonian in a 1923 Printmakers Society exhibition. They graciously donated seven prints to the Division of Graphic Arts at that time. 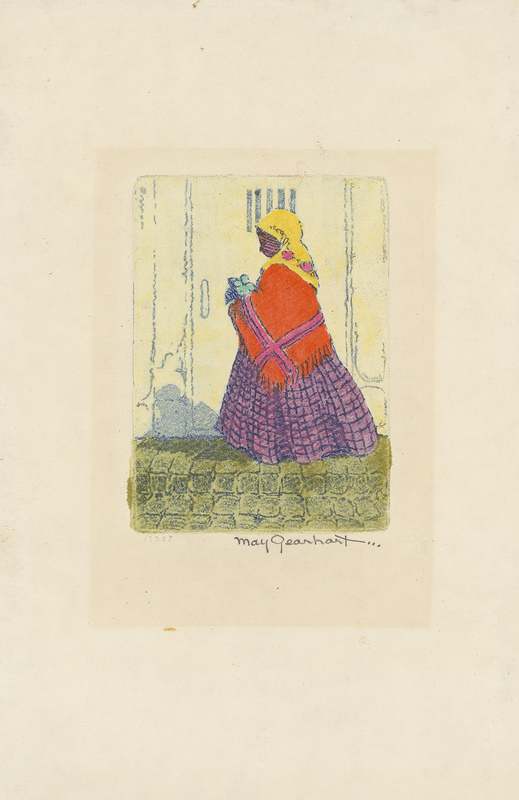 The sisters participated in other exhibitions during the 1920s: Frances's block prints were included in a color print exhibition organized by the American Federation of Arts that traveled to the Smithsonian in 1924, and Frances and May had a two-woman show at the Smithsonian in 1928. The sisters were very pleased with the response they received in the press and the sales they made from this exhibition. 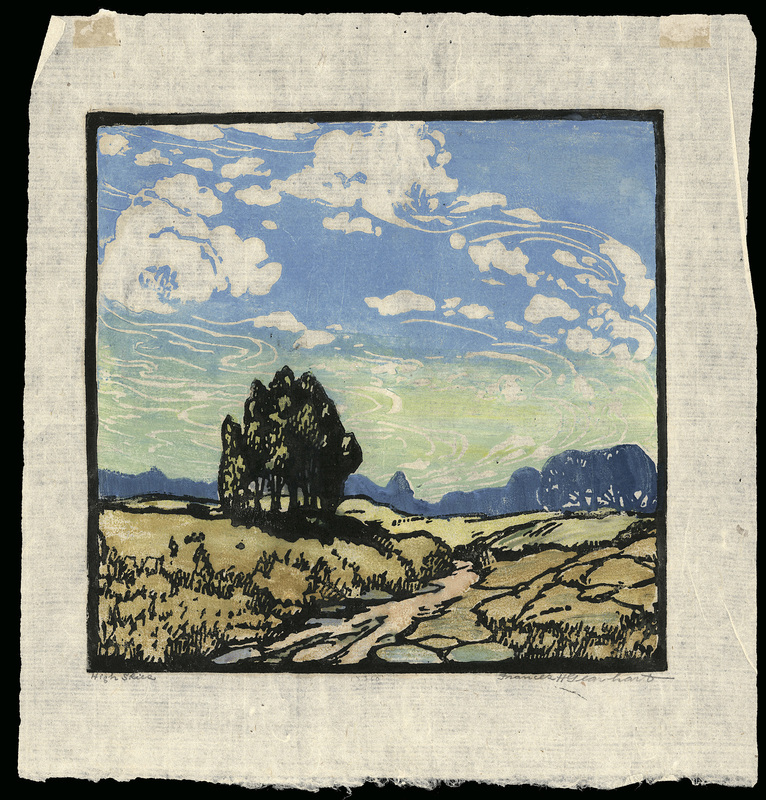 Frances donated an impression of her block print, This Joyous World, and as she commented to the curator, R. P. Tolman, "I didn't think Easterners would like our work." 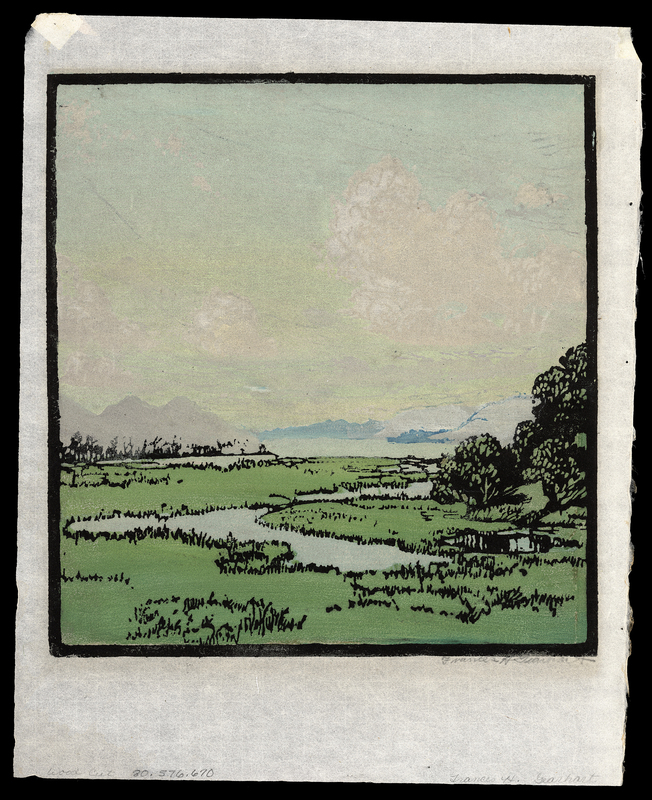 In 2009 the Pasadena Museum of California Art presented an exhibition of block prints and watercolors by Frances with an accompanying catalog, Behold the Day. Many of Frances Gearhart's prints are illustrated online and both sisters are featured in Paths to the Press: Printmaking and American Women Artists, 1910–1960 (Manhattan, Kansas: Beach Museum of Art, 2006). Helena E. Wright is the Curator of Graphic Arts in the Division of Culture and the Arts. She has also blogged about the artwork of Felix B. Gaines and Ethel Reed.